What is an English Cottage Garden? While the popularity of cottage gardens today is based largely on their aesthetic appeal, English cottage gardens were an important means of survival for peasants. Originally small parcels of land allotted to peasants to grow plants for their own use, cottage gardens used an informal design and dense plantings of vegetables, medicinal herbs, fruits and useful flowers as well as the occasional beehive and livestock. Over the centuries, the cottage garden continued oblivious to gardening trends, although flowers played an increasingly prominent role. It became a role model for some of the more radical garden designers of the 19th century who adopted its unpretentious style of haphazard profusion and accidental splendour. These designers chose simple abundance over some of the more rigid designs that were popular at the time. 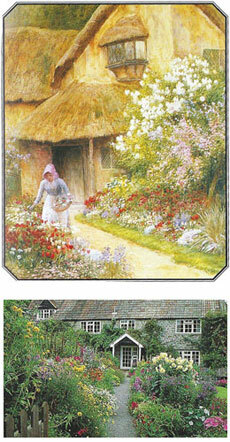 Traditional cottage gardens were often enclosed with a floral covered gate. Roses were, and continue to be, a popular flower for this purpose. Other features that make a garden a "cottage garden" include walkways, arbours and trellises. 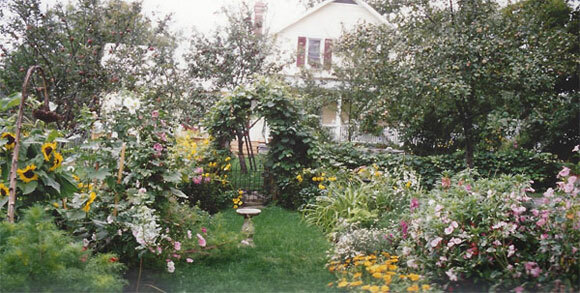 Cottage gardens emphasize informal design, naturalness, large masses of tall plantings, and ornamental grasses and vines. Like all things gardening, we encourage you to have fun with creating your own cottage garden. Spend some time looking at pictures and selecting your favourite flowers and designs. We encourage whimsy and your own personal touch as you create a garden that is uniquely you.